With the prevailing humidity in the atmosphere, it becomes inevitable to keep a balance between your canine’s comfort and flea treatments. Using topical flea controls in this season may not be comfortable for your pooches while using a flea treatment becomes a must in this season. To overcome the issues with these messy spot-on flea preventives, it is recommended to switch it with oral tablets. Nexgard for dogs is one of the most popular oral treatments for fleas and ticks. Manufactured by Merial, this oral chew is easy to administer due to its enticing beef flavor. If your pooch is reluctant towards topical treatments, Nexgard is always the option to rely on. Let’s see the positives of Nexgard! 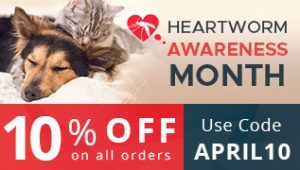 Topical solutions, flea shampoos, flea sprays, etc. can be really messy if your canines do not cooperate. Use of Nexgard chew may free you and your pooch from all the messiness of the topical preventives. Being an oral chew, it has no complications while administering it to the dogs. Have you ever noticed your fury friend flinching when you apply the spot-on? That may be the reaction to the bad odor that these solutions carry. If you choose Nexgard for dogs, your canine will be more than happy to chew this beef flavored tablet. 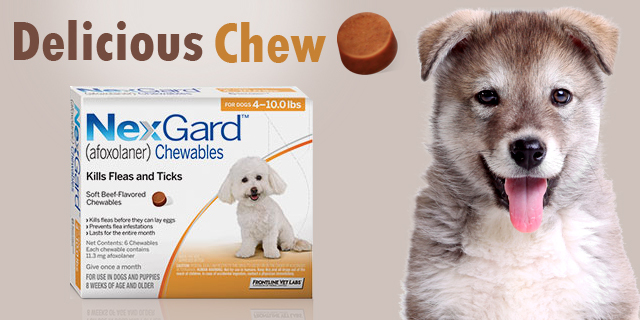 The deliciousness of this chew has made it the most sought after oral flea preventive. What makes Nexgard a distinct flea preventive is its unique key ingredient. Afoxolaner is the active ingredient that is used to formulate Nexgard, which is probably not used in any other treatment so far. Unlike other treatments, it does not numb the nervous system of fleas and ticks, instead it over stimulates it and causes hyper-excitation in these pests which becomes the reason of their death. Its quick mode of action starts eliminating fleas and ticks within 8 hours of administration. It has the potential to destroy 100% fleas within 24 hours while ticks are eliminated within 48 hours of administration. Nexgard for dogs is a complete flea preventive that not only kills adult fleas and ticks, but also terminates the growth its juvenile stages by destroying them. It ensures that there is no re-infestation of pests on your pooch’s body. Administering a single chew will protect your canines from pests for a whole month. So, it may take just a tasty treat for your pooch to be completely safe and healthy for 30 days. The best part about this delicious chew is that it has no side effects like vomiting, etc. It is a completely safe chew for your furry friends. These are the positives of Nexgard for dogs that differentiate it from the other flea treatments. Try it this summer and keep your furry friend safe from the flea bites and other diseases. PREVIOUS POST Previous post: How to protect your pet in different seasons?